• Fails to build on early up-move back above 1.1860 level. • Modest USD recovery prompts fresh technical selling. • Focus remains on German CPI/US GDP/Yellen’s testimony. The EUR/USD pair surrendered all of its early gains to 1.1883 and has now retreated over 50-pips from session tops, drifting into negative territory for the third straight session. 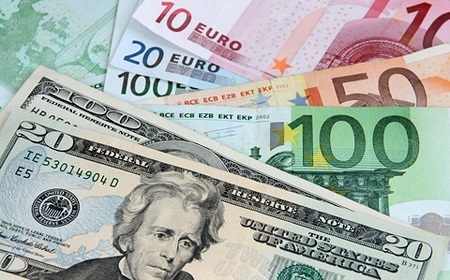 A goodish rebound in the US Treasury bond yields helped ease some of the bearish pressure surrounding the US Dollar, with traders opting to lighten their bullish positions ahead of the prelim German inflation figures. The headline CPI is expected to tick higher m-o-m, lifting the yearly rate to 1.7% for November as compared to previous month's reading of 1.6%. Meanwhile, the latest ECB bi-annual Financial Stability Review, revealing central bank's concern that higher rates may trigger concerns on debt servicing, also seems to have prompted some selling around the shared currency. The pair's sharp retracement over the past couple of hours could also be attributed to some fresh technical selling, especially after yesterday's slide below a previous strong resistance break-point, now turned support, near the 1.1860 region. From the US, the first revision of Q3 GDP figures would influence sentiment surrounding the USD and provide some short-term trading impetus ahead of the outgoing Fed Chair Janet Yellen's testimony before Joint Economic Committee of Congress. A follow-through selling pressure is likely to accelerate the slide towards the 1.1800 handle en-route 50-day SMA support near the 1.1760-55 region. On the upside, 1.1860-65 zone now seems to act as an immediate hurdle, above which the pair is likely to make a fresh attempt to reclaim the 1.1900 handle before aiming to test 1.1920-25 supply zone.